For the grown up crafter in your life, there are many ideas for that special Christmas gift. 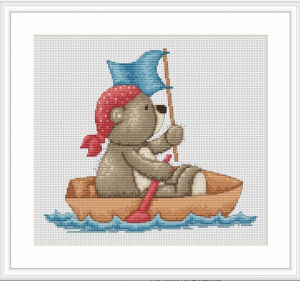 One really good idea is to buy a cross stitch kit that will enable them to have fun and interest while working the design, resulting in a beautiful picture which can be framed once all the work has been done. Obviously, different people have their own individual tastes and ideas of what they like to create and so we can only make some suggestions here which might resonate with what you know about your gift recipient. We’ve selected some designs that we at Crafty Bug love and hope you do too! As prices can easily change on the retailers’ websites (November 2018), I have grouped these ideas into price ranges based on the published prices at the time of writing. To find the actual purchase price, simply follow the link through to the product details. This is a traditional winter scene. All snowy and seasonal. 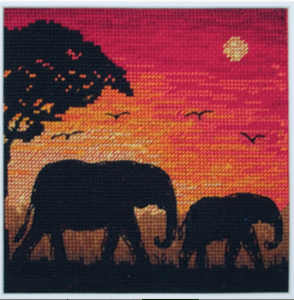 It’s always challenging working cross stitch with shades which are so close to each other but I think this would really be worth the effort. 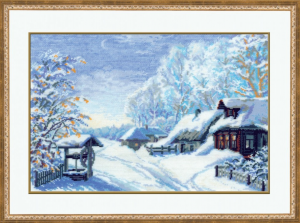 Although it’s not Christmas scene as such, this Russian Winter cross stitch kit would make a great Christmas gift that could be worked on over the festive season and then, perhaps, brought out each year to add to the scene setting when decorating the house. May be even a focal point to be decorated with tinsel! I am a great fan of the cross stitch sampler for a variety of reasons. I hate to admit it, but it is possible to get a little bit bored (might just be me) when working a large picture design. It really can feel like you are getting nowhere at times. 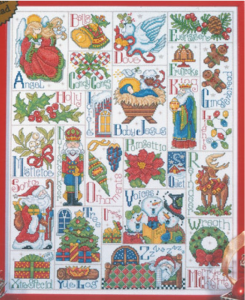 With a sampler, such as this Christmas ABC Sampler Kit, you can complete the work on any given section and feel that you have achieved something. Also, I rather like the “traditional” feel of a sampler. This Christmas Sampler Kit would make a good gift for someone who is a bit of a Christmas fan. It could perhaps be worked on over the festive season resulting in a finished product ready or display at each and every future Christmas time. 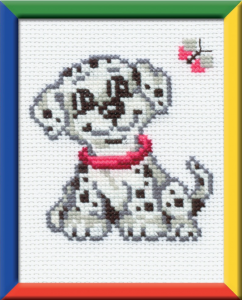 This Three Puppies Cross Stitch Kit would make a great gift for the experienced cross stitcher who is fond of cute puppy pictures! It will be a little challenging to complete as the colours of the embroidery silks will be so close to each other in shade, in order to achieve the appearance of texture of the fur. Working with silks only a shade or so apart can make it hard to know exactly where you are in the design but then it’s good to be challenged occasionally. 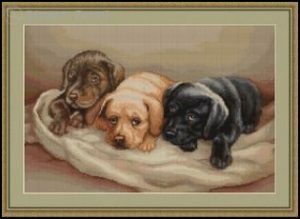 And the cuteness of these pups looking at you out of the canvas will make it all worthwhile. 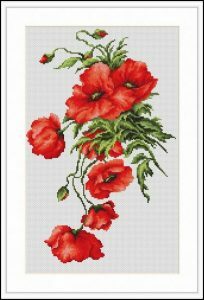 Flower designs always make an acceptable gift for the majority of keen cross stitchers and this beautiful Poppy design would be warmly received, I’m sure. It consists of just some red poppies and their foliage without any background distraction leading to a very “clean” design – I love it for its simplicity. And it’s nice to have a design in portrait layout for a change. This is, I think, a really striking design. In many ways, quite simple given the main subject matter is depicted in silhouette, but also challenging given the more limited colour range and the shade gradations of the pinks and oranges. A great gift for someone who likes to tackle something a bit different from the more usual “chocolate box” designs. I also feel it is a rather restful, calming picture. 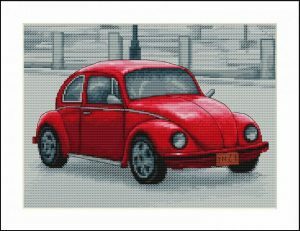 A picture of a car is perhaps a less than usual cross stitch project but this Retro Beetle Cross Stitch Kit has a certain appeal. Ideal for the car lover in your life, it would perhaps make a fun project to do with the finished article being gifted to someone keen on old vehicles. 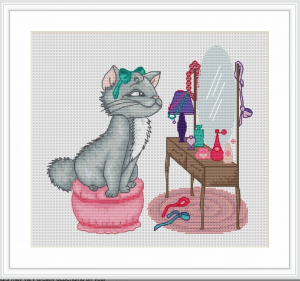 Or of course, you may know someone who not only loves cars but doing a spot of cross stitch too. I rather like the almost two-tone effect of this design and think it makes for a great picture which has interest but isn’t at all “fussy”. 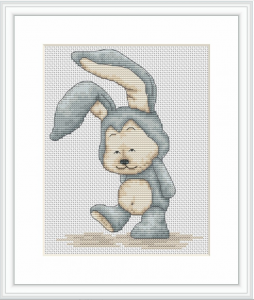 There are many cross stitch kits which, once completed, produce cute or funny pictures suitable to adorn children’s rooms or to give as a gift. We have selected some of our favourites below and these might make great gifts for grandparents. Something for them to have the fun of making and then the pleasure of giving the finished article to their grandchildren. And not just for grandparents – these would make great presents for anyone who loves a spot of cross stitch and has children they regularly give presents to. I hope this has helped provide you with inspiration for gift ideas this Christmas either for friends and family who already love to cross stitch or perhaps as a new craft idea for others.. To buy a cross stitch kit for oneself often feels like a bit of an indulgence so to receive one as a present is always welcome.